If you have ever doubted the impact humankind has on the environment, try going out of town and leaving your garden to its own devices for a few weeks. Porcelain berry? Check. Horseweed? Check. Nutsedge? Check. Don’t get me wrong, I’m interested in these plants, but right now I want them gone from where they have erupted, natives or not. Maybe I should learn to be more accepting, you say? (“A weed is but an unloved flower” - Ella Wheeler Willcox.) Well maybe next year. For now, it’s combat gardening. Meantime, it is meteorological fall, so maybe we can look forward to some cooler weather. Come out and join us on one of our bird walks, as fall migration picks up, and our bird populations start to shift. A reminder that our next Audubon Afternoon will be on Sunday, September 11, from 3 to 5, at Mason Neck State Park. Friends of Mason Neck State Park will be co-sponsoring this program focusing on the Lower Potomac River Important Bird Area (LPR IBA). The IBA stretches from Alexandria down through Stafford County along the Potomac. Matt Jeffrey, who works with IBAs and neotropical migrants for the National Audubon Society, will be our speaker. Come learn what you can do to help our conservation projects in the IBA. Mason Neck State Park has generously agreed to waive the Park entry fee for attendees; and we will be unveiling our new Northern Virginia Bird Checklist! And just a few days after that, note the Friends of Dyke Marsh program on Wednesday, September 14 – 7:00 at the Sherwood Regional Library. Sam Droege will be speaking about the importance and status of pollinators, especially bees, a subject that has been getting a lot of attention. ASNV is co-sponsoring this program. Join us for an introduction to the Lower Potomac Important Bird Area (IBA), and the key habitat and resources it provides to migrating bird populations. ASNV has “adopted” this IBA, which stretches south along the Virginia side of the Potomac River from Alexandria to Stafford County, and has been identified as an important bird area because of the habitat it provides for a number of species at risk, including Bald Eagles, a number of Neotropical migrants, and wintering waterfowl. We are delighted to be able to kick off our conservation efforts with a talk by Matt Jeffrey from the National Audubon Society. Matt is Deputy Director of the International Alliances Program, and has been with Audubon since 2006. He has more than 16 years of experience in the environmental conservation field. He has worked closely with and managed projects in several countries in Latin America and the Caribbean, including Mexico, Panama, Belize, Bahamas, Argentina, and Paraguay. His focus has been the protection of Important Bird Areas in Latin America and the Caribbean, specifically those concerning Neotropical migrant bird populations. This program is being co-sponsored by the Friends of Mason Neck State Park. Join us for the 35th Annual Manassas-Bull Run Christmas Bird Count on Sunday, December 18th. New to the count or just want to brush up on your survey skills? You will learn about what we do during CBCs, where the data goes, how we count birds and how to hone your counting skills. The workshop will be on Sunday, November 6th at 2 PM (note: this is the ‘Skins bye week) and will be at the NWF building, 11100 Wildlife Center Dr, Reston. To register click here For more information contact the ASNV office at: info@audubonva.org. Read More..
My husband, Sam Schaen, and I were fortunate to spend a few hours at the Hog Island Audubon Camp. 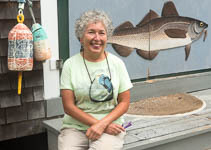 According to the website “the sanctuary and Hog Island Audubon Camp continue to provide people from all parts of the country with opportunities to experience and learn about nature on the coast of Maine.” Hog Island is celebrating its 80th anniversary as the Audubon Camp. Read More..
Now is the time to urge your candidates to support conservation. In addition to electing a U.S. president and vice president this year, Virginians will elect 11 members of the U.S. House of Representatives. You can question the candidates, ask for their conservation priorities, get involved in the campaign of your choice and make the case for conservation. Read More.. The 100th anniversary of the U.S. National Park Service (NPS) this year is an opportune time for advocates to urge elected officials and candidates to provide stronger support, especially more funding, for our 413 national park sites. From Yosemite to Acadia, from the Everglades to Denali, our national parks represent our “most beautiful, treasured and historic places,” says NPS Director Jonathan Jarvis. Virginians are blessed with parks like Shenandoah, the George Washington Memorial Parkway and its units, Prince William Forest Park, Manassas National Battlefield Park and more. The National Park Service (NPS) is preparing a plan, called a “recreation plan,” for Jones Point Park in Alexandria on the Potomac River. At least 84 species of birds have been observed in the park. NPS is seeking public input by September 9 and wants the plan to “reflect community needs.” The current draft strongly emphasizes recreation. Auduboners may wish to urge NPS to preserve and restore more natural areas, to plant more native plants and to restore more biodiversity. More natural areas on Jones Point and along the river could provide experiences like outdoor “classrooms,” nature study, nature walks, nature photography and bird and wildlife watching, for example. You can find the draft plan and submit comments at https://www.nps.gov/gwmp/getinvolved/planning.htm or here http://parkplanning.nps.gov/draftjpprecplan. The NPS contact is Joshua Nadas, 703-419-6424. You can speak out for conservation at several meetings that will focus on the Virginia Outdoors Plan, now being revised by the Department of Conservation and Recreation (DCR). State officials are gathering information about the need for conservation and recreation across Virginia to update the plan. DCR describes the plan as follows: “The Virginia Outdoors Plan is the state's comprehensive plan for land conservation, outdoor recreation and open-space planning.” Read More..
You can speak up for tree preservation and restoration at the Mount Vernon-Lee District Tree Forum titled, “Keeping Trees Healthy and Canopy Strong,” October 17, 7:00 to 9:00 p.m., at the Walt Whitman Middle School Auditorium, 2500 Parkers Lane, Alexandria, VA 22306 (Mount Vernon area of Fairfax County). The event is free; no RSVP required. Read More..
Join the leaders in the parking lot off Prosperity Ave. for a casual walk along stream bed, garden plots, and wood edges. Elizabeth Fenton and Catherine Kubo lead. Sponsored by the Northern Virginia Bird Club. Join leader Larry Cartwright on this “back side” of Huntley Meadows for an end of summer walk through woods to the pond edges where we hope to find some migrant shore birds. Sponsored by the Northern Virginia Bird Club.